One of the most popular outdoor activities for good reason and available at thousands of locations UK wide. 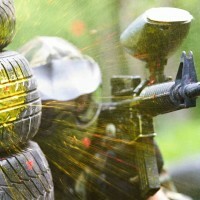 With so many venues and styles of paintball available, it is hard to begin to describe the range of arenas on offer. Paintball is one of the most popular adventure activities and available at thousands of locations countrywide. Perfect for any adventurous group, especially birthday parties, stag weekends, hen dos and mixed groups getting together for an active day out, you cannot go wrong with this favourite. With so many venues and styles of paintball available, it is hard to begin to describe the range of arenas we can offer. From disused buildings and vehicles to pine forests and water features, there are hundreds of ways and places to hide from the enemy. But are you smart enough to win in the end? Paintball is particularly popular as part of a weekend package. Just drop us an enquiry to find out more, select your other activities, accommodation and nightlife options.